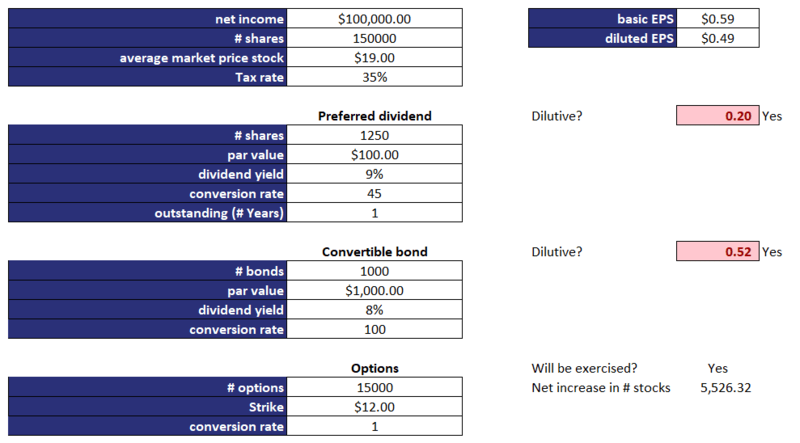 Antidilutive securities are options, warrants, convertible debt, and convertible preferred stock that, when exercised, will increase EPS. how to calculate diluted EPS? To learn about diluted EPS it is best to compare it to the regular EPS. In particular, diluted EPS is regular EPS but adjusted in a number of ways. Conceptually, the difference between basic and diluted EPS is that the former does not take into consideration that some securities may be converted into common stock, while the latter does. We also have to adjust the denominator. In particular, we have to add the number of common shares outstanding for the relevant period as if the dilutive securities are exercised. In other words, we have to calculate the number of fully diluted shares. If dilutive securities is issued during the year, we only need to consider the increase in the number of common shares for the part of the year that the shares were outstanding. Calculating the weighted average shares outstanding is the most tricky part in calculating diluted EPS. Stock options and warrants are dilutive only when they are in-the-money, i.e. when exercising them is profitable. To determine the number of additional stocks that will be outstanding, we need to use the treasury stock method. The net increase in number of stocks is equal to the total number of stocks created as a result of the exercise of the options or warrants minus the stocks bought using the proceeds received from the exercise. While the diluted EPS formula looks complicated, the intuition is pretty straight-forward. To the numerator we add back any income that would otherwise be distributed but that we do not have to distributed when the dilutive securities are exercised. In the denominator, we add the increase in common stock that results from the exercise of the dilutive securities. It is very important to realize that we have to check, for each type of security, whether they are indeed dilutive. If not, we can ignore the security! It is easy to perform the diluted earnings per share calculation using a spreadsheet. Below we include an Excel spreadsheet that implements an equity dilution calculator. The following figure illustrates the calculations needed.